Rebecca M. Myerson, Lisandro D. Colantonio, Monika M. Safford, and Elbert S. Huang find that in-home assessments for high cholesterol, hypertension, and diabetes among previously undiagnosed Medicare beneficiaries spurred a 22 percentage point increase in regular doctor visits for care, with the biggest increase for those found to have diabetes. The authors found no significant differences in care-seeking behavior among those newly diagnosed by gender, race, Medicaid eligibility, income, marital status, or living in a Health Provider Shortage Area; yet, patients without established providers were less likely to visit the doctor for care. Beneficiaries with undiagnosed illnesses at the point of assessment were more likely to both lack a routine provider and have higher blood pressure, fasting blood glucose, total and LDL cholesterol, and lower HDL cholesterol than those previously diagnosed. These findings highlight the impact in-home assessments can have on care-seeking behaviors, as well as underscore the need for new ways to engage hard-to-reach beneficiaries. The full study is available at Health Services Research. The press release for the study is available here. Citation: Myerson, R. M., Colantonio, L. D., Safford, M. M., & Huang, E. S. (2018). 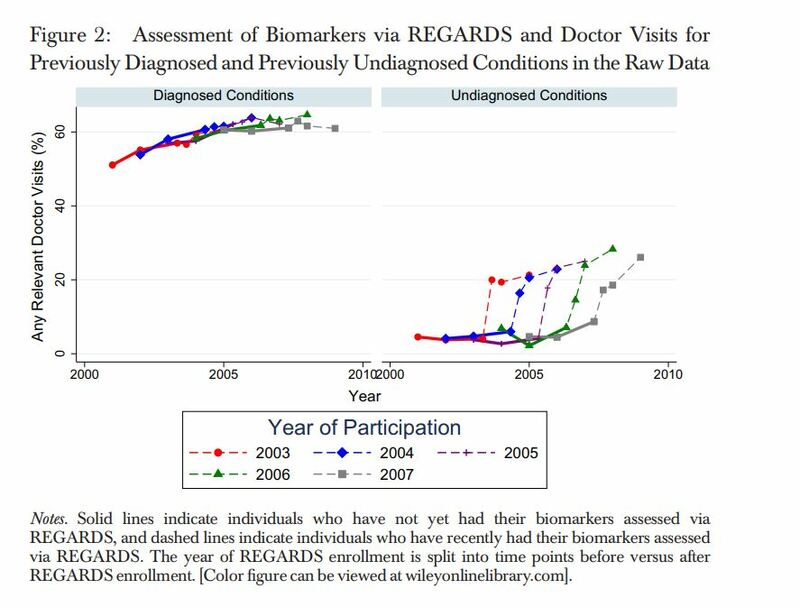 Does Identification of Previously Undiagnosed Conditions Change Care‐Seeking Behavior?. Health services research, 53(3), 1517-1538.